For last Webtuesday I gathered a few historic data of the «tag movement» (that got very quiet in the last two years). It sure appears to me like tagging has never moved beyond the "technology trigger" stage. Looking at the Google Trends graphic, the amount of press and search attention being paid to tagging looks to be pretty constant since the start 0f 2005. (Other than Digg, and I seriously doubt that it is tagging which is causing the churn). If you look at the number of people using del.icio.us: That was fast, it took them a long time to reach 2 million users. When you see sites like iLike add 3 million users in two weeks, it's hard to be impressed with a paltry 2 million total users. 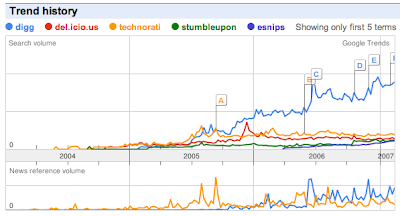 Del.icio.us and most social tagging sites are still in the early stage of adoption. All you have to do is take one look at the homepages for these sites to see that the articles being tagged are almost exclusively about technology. The general population has not adopted social tagging technologies in any mass way. 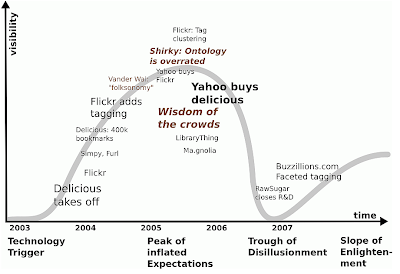 It's way too early in the game to say that tagging has entered the "trough of disillusionment".